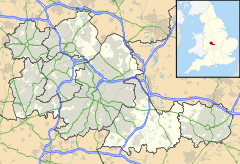 Moor Pool (or Moorpool) is a 22.32 hectares (55.2 acres) garden suburb within the ward of Harborne, Birmingham, England. It was designated a Conservation Area in July 1970, which was raised by an Article 4(2) direction order in 2006. A Conservation Area Character Appraisal and Management Plan was adopted in March 2012. The Moor Pool estate was established in 1907 by John Sutton Nettlefold, who was part of the Guest Keen Nettlefold (GKN) family. It formed part of the Garden City concept, shared by George Cadbury in Bournville, to create low density housing with many interspersed green spaces, and community facilities. The estate was built with a community hall (complete with skittle alley and snooker tables), two tennis clubs, a bowling green, numerous allotments, and the Moor Pool (pond) itself; all of these facilities remain today for residents' use. The homes and buildings were designed by William Martin, an architect known for working with John Henry Chamberlain to build 41 of the Birmingham board schools (including the nearby Harborne Clock Tower / School Yard), through their practice Martin & Chamberlain. In 2014 the residential landlord of the estate, Grainger plc planned to sell off the local amenities, including the hall, the bowling green, tennis courts, skittle alley, fishing pond, some open space and shops. The Moor Pool Heritage Trust made a deal with Grainger to acquire the community facilities for £325,000. After a fundraiser, which included a £98,900 Heritage Lottery Fund grant, the acquisition was completed on 14 December 2014. In 2016 it was announced that Moor Pool Heritage Trust had been awarded over £8,500 to create a pocket park on an overgrown site on the corner of Margaret Grove and Moor Pool Avenue. The name Nettlefold Garden was chosen (after a naming competition), to reflect the heritage of the Moor Pool estate. The park was officially opened to the public by Cllr Carl Rice, the Lord Mayor of Birmingham, on 21 May 2017. II* Particularly important buildings of more than special interest. II Buildings of national importance and special interest. ^ "Birmingham garden suburb could lose facilities". BBC News. Retrieved 15 February 2015. ^ "Moor Pool Conservation Area Designation Report" (PDF). Birmingham City Council. Retrieved 15 February 2015. ^ "Moor Pool Harborne Conservation Area". Birmingham City Council. Retrieved 15 February 2015. ^ "Moor Pool Conservation Area Character Appraisal and Management Plan". Birmingham City Council. Retrieved 15 February 2015. ^ "Moor Pool Estate saved after Heritage Lottery Fund grant". Birmingham Post. Retrieved 15 February 2015. ^ "Moor Pool Clubs, Societies and Associations". Moorpool Residents' Association. Retrieved 15 February 2015. ^ "The Clock Tower". Historic England. Retrieved 7 April 2017. ^ "Historic Moor Pool Hall in funding race for survival". Birmingham Post. 22 May 2014. Retrieved 22 May 2017. ^ "Moor Pool Estate saved after Heritage Lottery Fund grant". Birmingham Post. 23 December 2014. Retrieved 22 May 2017. ^ "Moor Pool Heritage Trust Acquires Community Facilities". Moorpool Residents Association. Retrieved 22 May 2017. ^ "See where the six new mini parks planned for Birmingham will be". Birmingham Mail. 22 February 2016. Retrieved 5 April 2017. ^ "Moor Pool Duck Issue 89" (PDF). Moor Pool Residents' Association. April 2017. Retrieved 5 April 2017. This page was last edited on 21 June 2018, at 07:06 (UTC).